The following ID products will provide extra protection to your pet whether they are at home with you or accompanying you on a trip. 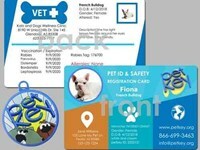 If your pet's ID tag or card becomes damaged or outdated be sure to order them a new one right away. 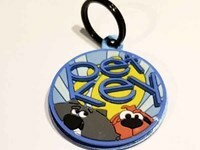 This Silicone and Metal ID Tag provides the ultimate protection and style for your pet. 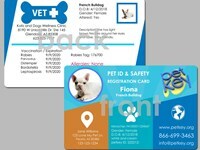 This tag will be personalized with your pet's name, ID and your phone number or other line of custom text (If not specified the custom line of text will automatically be your primary phone on file). Includes a black ring to attach to your pet's collar or harness. The silicone front helps prevent wear and noise from other tags. 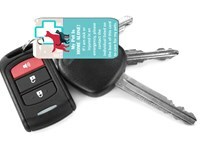 Three Mini ICE Cards for attaching to your keys, purse or anything you keep with you to inform emergency personnel of the person they should contact to care for your pets in the event of an emergency. 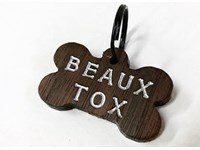 Made in the USA these wooden ID tags make a unique fashion statement for your furry best friend. Engraved on both sides - one side with his/her name and on the other side your phone number. Made from solid wood and finished off with a clear matte varnish and silver reflective paint.